The time has come. We are now finished with our prediction poll. It looks like a Trump victory. Clinton has a higher probability to win the elections because she needs just one of the key swing states, while Trump needs all of them. We ran 100,000 different simulations for the total number of votes for Clinton and the maximum of the distribution of probabilities is at 274 votes, which is above the needed 270 to win. We’re predicting Trump to take the key swing states: Florida, North Carolina, Ohio, New Hampshire, and even Pennsylvania. This should bring him to about 284 electoral college votes. On the other hand Hillary is likely to stay at 254 votes. However, the result is extremely close, with our method giving Trump just a slight edge in the key states. Having said that, all it takes is for Hillary to overturn either Florida or Pennsylvania and she will win the election. 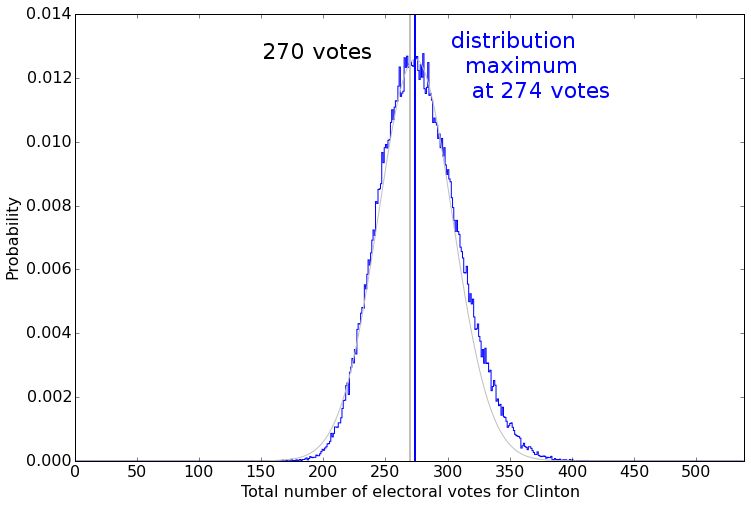 Actually, her probability to win the elections is 57.3%, compared to the Trump’s 42.7% because she has more ways to reach 270 electoral votes (see the probability graph above). We can easily say that the 5 states are toss-ups and give them to no one, thus relieving ourselves from any post-election responsibility, but where’s the fun in that? A few words on the method before we examine the results. Unlike most polling aggregation sites, prediction models, or markets, we are using an actual poll. So we don’t just pick up all the ‘low-hanging fruit’ polling data and run it through an elaborate model. We need to get actual people to come to our site and take the time to make a prediction for their state. So instead of just picking up raw data and twisting it as much as we can, we need to build our own data. Given that we were doing this with limited resources explains why our sample size is rather small (N=445). However even with a small sample we still think the method works. Why? Our survey asks the respondents not only who they intend to vote for, but also who they think will win, by what margin, as well as their view on who other people think will win. It is basically a wisdom of crowds concept. The idea is to incorporate wider influences, including peer groups, that shape an individual’s choice on voting day. It is going to take a number of experiments to answer the question of whether contemporary polling can be considered scientific and whether this method is indeed the best one. Our method is just the beginning of such experiments. You should therefore take these results with a pinch of salt, even if they turn out to be true. The method is still work in progress and will continue to be so in a number of forthcoming elections. Knowing that our sample is likely to be small we have focused our entire attention (and money) towards the swing states. Predicting them correctly gives us a good chance of guessing the entire outcome, expecting that the traditional Red and Blue states will vote as they always do anyway. This is why for about 20 states we did not even try to get a larger sample, knowing they will not be that hard to guess (e.g. ND, SD, WY, MT, ID, AK and some Southern Red states like OK, AR, MS are obviously going to Trump, just like OR, HI, CT, RI, DE, VT, or ME will go to Clinton) (for CA, NY, IL and TX we got enough votes to make our own predictions, given that these are populous states so they obviously caught a few more voters). Have we had more resources to spend (read: money), we would have gotten enough data to predict all the states. But it makes no difference whatsoever to our final prediction. For the aforementioned states where we had a low number of survey respondents we simply took the average of several polls, including FiveThirtyEight’s polls only data, YouGov, Huff Post, PollyVote and the aggregate polls at Real Clear Politics. Some may overlap, but the point of this task was simply to call the Red and Blue states accordingly. Which we did, and this aligns with everyone else. For the following swing states we relied solely upon our own prediction survey: PA, VA, NH, NC, FL, OH, IA, MI, WI, CO, and NM. We also had enough data to make viable predictions for much of the Southern states (GA, SC, AL, TN, KY, LA) and others like UT, AZ, KS, MO, MA, MD, DC, WA, MN (this is in addition to the ones mentioned above: CA, NY, IL, TX). 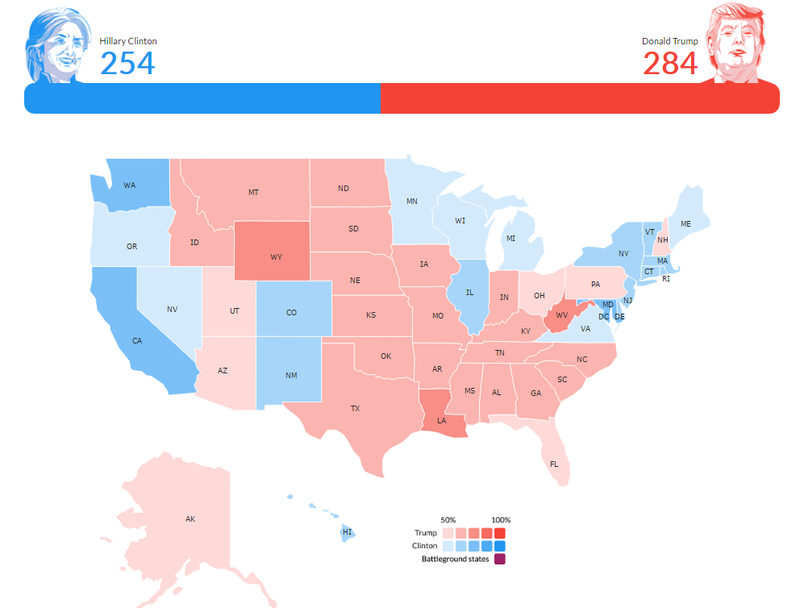 The non-swing states are all aligned in their traditional Red-Blue pattern (predictions for these showed in the graphs below). For Nevada and Maine we unfortunately did not have enough voters of our own to make a prediction so we used the average polling data as well. This means that the results reported for Nevada and Maine are not our own, but an average of others’ predictions. For Maine we gave 3 electoral votes to Clinton, and 1 to Trump (from Maine’s second district). Altogether we used our model to make predictions for 30 states (29+DC), and for 21 of them we used the polling averages. Again, the point was to correctly predict the swings in order to estimate who wins it. Our results differ considerably from the majority of the forecaster crowd for the following states: we give North Carolina and Florida to Trump (most label them as toss-ups), and we also give New Hampshire and, shockingly, Pennsylvania (!) to Trump. Not a single prediction model gives Pennsylvania to Trump, and only PEC gives Hillary a run for her money in New Hampshire. We also give Ohio and Iowa to Trump, while predicting that Hillary will take victories in Virginia, Michigan, Wisconsin, Colorado and New Mexico. Now if we’re being a bit more careful with this we would also say that Florida, North Carolina, Pennsylvania and New Hampshire are all within the margin of error, and are therefore – too close to call! In other words, we predict that these will be the crucial battlegrounds where the election will be decided. So far we believe Trump has an edge in each of these. However, if Trump manages to lose either Florida or Pennsylvania, he will lose the election. Which is why our prediction is quite bold in its statement. It seems that Trump is on much shakier ground than Hillary, however if he indeed does manage to keep an edge in all these four states, as our model predicts he will, Trump will win the election.